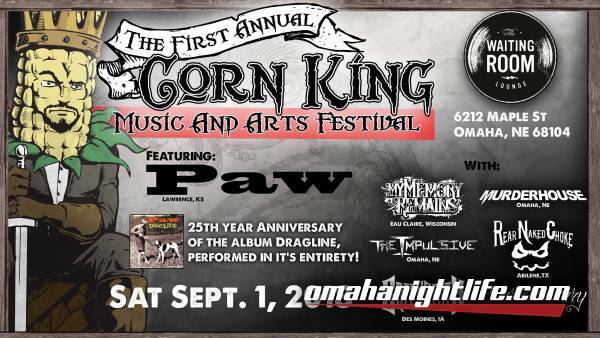 The First Annual Corn King Music and Arts Festival! All ages / Doors at 4:30pm. 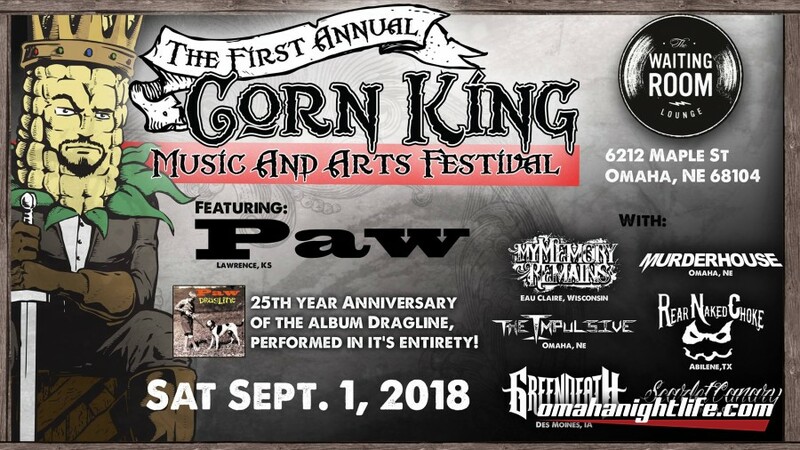 On the 25 year Anniversary of the groundbreaking album Dragline being released by Lawrence, KS band Paw will be playing Dragline in Its entirety! Also on the bill are the legendary Omaha, Nebraska band MurderHouse with fellow Omaha musical brothers The Impulsive! 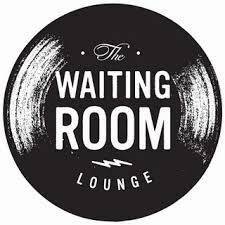 The relentless touring band Scarlet Canary from Denver, Colorado will also be performing, along with one of the hottest new bands from Eau Claire, Wisconsin My Memory Remains. Hailing all the way from Abilene, Texas and recently on Dave Ellefson's, from Megadeth, new Combat Records compilation COMBAT BULLETS VOL 1.0, is Rear Naked Choke. Their debut album released this year was produced by CJ Pierce Official from Drowning Pool. Also on Combat Records compilation COMBAT BULLETS VOL 1.0, whose track features a guest appearance by Dave Ellefson is EMP Label Group recording artist Green Death from Des Moines, Iowa!!! Nebraska Cornhusker Nation who attends the Nebraska Football season opener in Lincoln, Nebraska that day, will recieve $5 off the door price with proof of purchase. Veterans will also receive $5 off the cost of door admission only with active duty military receiving free admission with valid military ID at the door!